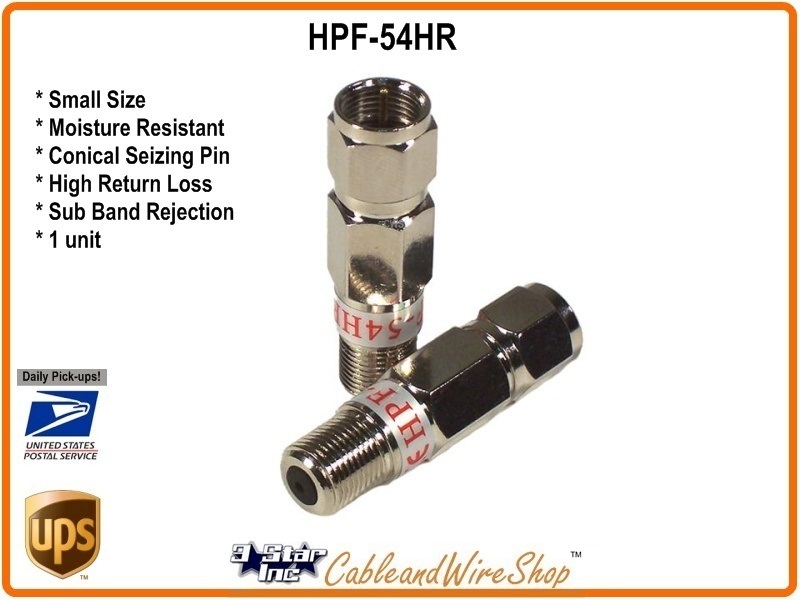 (1 each/unit) This In-Line F Connectorized Filter attenuates ingressive noise in the sub-band section of the cable spectrum by blocking 5 to 45 MHz. This also prevents the return channel of Set-top Converter boxes from communicating with the Office by eliminating or restricting user access to the sub-band return frequencies which in some cases leads to delayed or missing billing of transactions. Note: Technicians will use this filter to block sources of interference from combining back into the cable drop feeding from the pole or pedestal. They will apply these filters to ports of Splitter feeding TV's without set-top converter boxes and leave the Hi Speed Internet modem without this filter (as not to shut it down). When installing Cable TV, the drop feed from the pole or pedestal will attach to or appear at the same location that Telephone and Power connect to the house. This provides an easier means of Bonding or Grounding the installation. At this point, the cable line is grounded by means of a grounding block or surge protector and is accompanied by or colocated with the DeMarc (usually a little box), where the Cable Company can connect or disconnect, and provide a central location for the first Splitter That will cables running to different locations (TV sets) in the home. It is at this first Splitter Location that the run feeding a modem should be portioned off (split) and isolated from the rest of the feeds. As a Hi Speed Internet Modem is a 2-Way device, 2-Way access should be unfettered by extra loss of signal or traps and filters. The other feeds that go directly to end-user devices (TV's) are in effect, Home Run (Direct Fed as opposed to a Loop Fed) and can be individually connected, disconnected, filtered, etc. without one affecting another. It is this wiring scenario that allows for placement of filters to ngate noise and interferencwe contribution from other locations in the home from interfering with the Modem's return channel. However, any Set-Top Converter boxes that are on filtered cable feeds will also find their return channel blocked, preventing it from talking to the Cable TV Office's central and Billing computer. With time, many homeowners simply split off to feed another location from an existing one, on and on, until they have a cable loop (Loop Feed) starting at one location and ringing around the premise, splitting off signal to feed other TV's along the way. This is an undesirous scenario as the signal loss from cable and Splitter mounts, depriving the end location of enough signal to work properly, and devoid of any individual location control from a single common location .